Igel Orthodontics is about happy faces and better oral health. In every sense. Dr. Kort Igel is a third generation Omaha dentist who has practiced for more than 20 years. His reputation for high-quality orthodontics is widely known. This is the eighth time Igel Orthodontics has earned the title “Best Orthodontist” from The Reader magazine’s annual poll. Dr. Igel said he and his team are always humbled by the recognition. The doctor said he focuses on airway-centered orthodontics. We want to prevent airway issues and these issues can be addressed at a very young age. Nearly 50 percent of Americans have crooked or misaligned teeth. Each new Igel Orthodontics patient is given a complimentary consultation. Dr. Igel reviews, with digital images and xrays, each patient’s status . He then presents customized solutions, answers questions and outlines an individualized corrective treatment plan. “The bottom line is, we treat each patient uniquely to open the airways to prevent dental & skeletal components that may cause sleep apnea.” Early intervention is critical to creating beautiful & healthy smiles. Centrally and conveniently located at 108th and Pacific, Dr. Igel said he and his team focus on “energetic and fun-loving service” with a variety of treatments. They make state of the art orthodontics comfortable and relaxing. Their office is painted in soothing colors. Music and lighting are designed to help patients relax. The Igel team strives to make each patient comfortable. 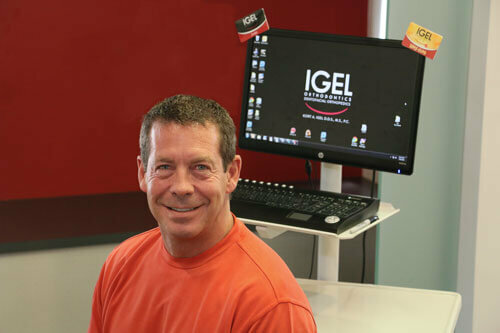 Igel Orthodontics sees patients of all ages, although about 25 percent of his patients are adults. Treatments are customized and personalized. Many of his teen and adult patients favor Invisalign, a brace that takes a modern approach to straightening teeth. Invisalign uses a series of aligners custom-made for each patient. Aligners gradually and gently shift teeth into place. They are replaced every one-two weeks until treatment is complete. It’s a welcome difference from traditional braces. To assure their patients are knowledgeable and informed, Igel invites patients to learn more about orthodontics. The Igel website is filled with information. You’ll find a glossary of dental terms, before-and-after pictures, and hundreds of satisfied patient reviews! Igel Orthodontics is ahead of their competitors with their iTero machines, said Linda Lutmer, the practice’s administrator. Utilizing the ITero scanners lets Dr. Igel digitally scan a patient’s mouth and teeth. With this technology, messy impressions are a thing of the past for our patients. Patients are also excited about our office now offering AcceleDent® Aura. AcceleDent® Aura is a simple-to-use, hands-free device designed for faster orthodontic treatment with only 20 minutes daily use. This medical device uses gentle micropulses, called SoftPulse Technology®, where bone remodeling is accelerated, allowing teeth to move up to 50% faster! Our patients love the reduced treatment time and have even commented that it eases discomfort. Igel Orthodontics is service oriented, Linda said. Payment options are reviewed ahead of time offering convenient and flexible options. And our office handles all insurance processing for patients. “Appointment options are as flexible and convenient as possible,” she said. We accept new patients and we ensure room in our daily schedule for any emergency that may arise. Every mouth, every face is unique – and it is our goal to provide a beautiful & healthy smile for life.